If you love scenery, driving through pretty villages, stopping at ancient little churches, and breathing in fresh mountain air then you will love this trip. Why Visit The Troodos Solea Valley? Leave the Lemesos (Limassol) - Pafos motorway at the exit for Ypsonas and Kouris Dam and head for the dam. Mount Olympus is ahead as you drive through wild olives and Aleppo pines to the west of the reservoir, following signs for Alassa. Go left onto the B8 to Trimiklini,a village thriving on the production of almonds and fruit. At the major crossroads,go right onto the E801(B9). Saittas is a settlement built around a government-run experimental fruit nursery. Its setting among tall pines on the left bank of the Kouris River attracts many visitors and there is rural accommodation at a small hotel. The houses in tiny Filagra are now mainly summer homes. You can take a detour off this road to Mesa Potamos, where there is a delightful monastery and waterfalls. Back on the main road, on your left at Kato Amiantos are some unusual old dwellings with overhanging balconies. Near the top of the steep gradient, mavrahero, wild lentils colour the hillsides mauve in spring. Stay on the B9 at the crossroads and follow the signs for Kakopetria. 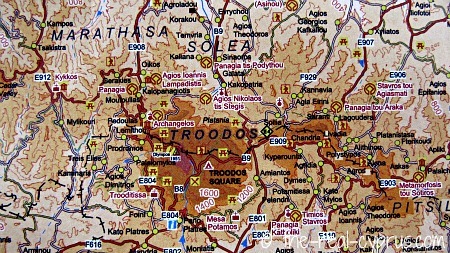 Karvounas is the saddle between Troodos and the Madari range and the watershed between the Kouris and Kargotis rivers. The terrain now changes to immense pines (Pinus brutia). As you go down, a hundred metres after the turning to Platania picnic site, there is a moufflon reserve on the right. Further down the road are several trout farms, some with their own restaurants. Go left at the sign for Agios Nikolaos tis Stegis and continue to the church. The name of the church means St Nicholas of the Roof, was built and painted in the early 11th century, and is one of the ten mountain churches on the UNESCO World Heritage List. A steeply pitched outer roof protects the original dome from rain and snow. This church is famous for being covered entirely in wall paintings dating from the 11th to the 17th centuries and one of the most interesting examples of Byzantine churches in Cyprus. Go back and go left at the sign for Kakopetria. 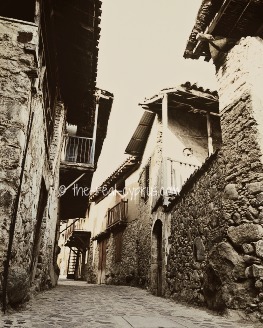 Clinging to both banks of the Kargoris to your left as you enter, is the old village of stone and mudbrick houses with pitched roofs, many of them restored. Kakopetria is a holiday resort with banks, petrol stations, hotels and restaurants, including a Vahkis scheme taverna, The Mill Hotel & Restaurant, which is incredibly imposing when you see it first. The Vakhis scheme means the restaurant, cooks traditional cyprus food with traditional ingredients and in traditional ways, true to the Cypriot culture. The village was also famous as a silk producing centre and there are still many mulberry trees around if you look around you. 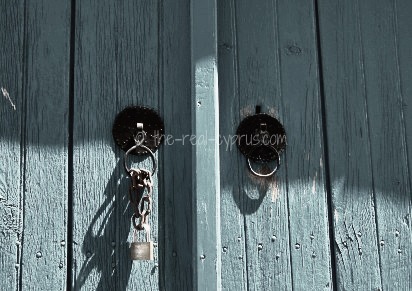 It is a long way to go to go to find them locked! As you leave on the road to Galata, there is a restored 18th century watermill to your left. Huge trees shade the square at Galata and nearby are fine examples of its distinctive terraced buildings with wooden balconies and staircases. Some of them have been restored and one is a Folk Art museum. Across the river is the UNESCO World Heritage listed church of Panagia tis Poditou, an early 16th century building with its outer roof extending almost to the ground to cover the portico. The Solea villages run into each other and next up is Kaliana with its preserved hani, inn, with arches, mudbrick walls and sloping roof. 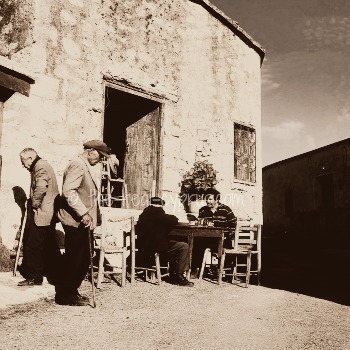 The 18th century building is a Folk Art Architectural site and you can see examples of pitharia wine jars and a traditional bread oven in the yard. Driving to Temvria, you continue through a metaphorical fruit salad. After apples, pears, plums and cherries, you now come to mespila, loquats, citrus and pomegranates among gardens awash with colour. Fresh herbs are an integral part of Cypriot cuisine, and many herbs such as thyme and sage grow wild in the countryside. Because of the island’s dry climate the herbs contain a higher than normal quantity of natural oils, which makes them very pungent. Follow the signs for Korakou, where figs and prickly pears are added to the fruit bowl. Go left at the fork and round the church; then go right at the street sign Eleftheria Avenue. Follow this road until you come to an old watermill and ruined bridge opposite the signpost for Evrychou, then go left after first building, a modern olive mill, onto a cobbled road, which was part of the old camel road from Lefkosia (Nicosia) to Troodos. It ends at a railway station - the terminus of the old Cyprus Government Railway, completed in 1915 and which went from Ammochostos (Famagusta), via Lefkosia (Nicosia) to Evrychou. Observation: In case you hadn't noticed Cyprus does not have any rail system at all on the island in use today. Go back to the main road, go left and left again at the t-junction. Evrychou is a large village where cotton used to grow. Today it is a regional centre and the seat of the Bishopric of Morfou. Fork right at the church, drive up to the B9 and go left at the signpost for Lefkosia. As you drive north, the pines give way to olives and cereals and you can see Morfou Bay on your left. Go right onto the road to Koutrafas and follow the signs for Asinou Church. Kato Koutrafas, (Kato meaning lower) with its stone and mudbrick houses, is on the edge of the Mesaoria, central plain and the cornfields are parched and barren in summer. At one time, you had to hire a donkey at Nikitari to take you to Asinou, but now it is just a short drive. Panagia Asinou, one of the most well known of the UNESCO listed churches, sits in a tiny isolated meadow among dense forests. It was built and painted in 1105 and contains fascinating frescos. Go back and go left at the small green sign to Agios Theodoros. This all-weather forest road is bumpy at the start but smoothes out at the top of the hill, from where there is a panoramic view of Morfou Bay, the central plain and the Pentadactylos (Kyrenia) Mountains. Go left at Agios Theodoros, a village of almond trees and traditional houses, and follow the road signposted to Spilia. The beautiful Atsas River valley winds up through well-irrigated terraces of almonds, olives and vines. At Kourdali,stands the mediaeval church of the Panagia. The belfry of the village church dominates the skyline at Spilia, a village popular with hikers and which has rural accommodation. Leave on the F929 signposted to Kannaviou and go right at the top, heading for Kyperounta. On the way down are wide views of terraced vines and the Madari hills. Go left onto the E909 and go right at the sign for Kyperounta. Then take the left fork and on your right is the Rural Life and Natural History Museum in a restored building. The village also has a winery and a hospital. As you drive to the apple growing village of Dymes, there is a deep wooded valley to your left. In Potamissa, many people grow their vines on frames across the road as there is no room on the steep hillsides. 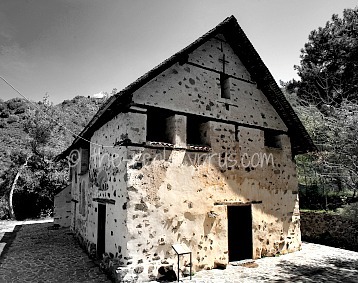 Take the F806 to Pelendri and go into the village to the UNESCO World Heritage listed 13th century church of Timios Stavros. Also, do not miss the Panagia Catholiki church with its Byzantine/Italian frescoes. As you head for Trimiklini, you will pass a winery on your right. Go left onto the B8 and go left again onto the F812, signposted to Ayios Mamas. Drive through the centre of this village of whitewashed stone houses,then go right and head for Kapileio. This village, which is known for early peaches, stands on a hillock and has extensive views all around. Continuing, on the hillside to your left are the ruins of old Korfi, which was abandoned after landslides, and after new Korfi, there is a vista of the Kouris Dam, Lemesos (Limassol) and the Akrotiri Salt Lake. Go right into Apesia, and behind the church and restored olive press is a small area where time seems to have stood still. Old houses and villagers inhabiting them just as their forefathers did. Go back to the main road and go left for Lemesos (Limassol) and the motorway. This is an ideal journey to spread over a day or two, with a stop here and there. The Mill Hotel & Restaurant - famous for trout on the menu, highly recommended to try at least once. The Linos Hotel - very traditional and extremely popular.